New residents to the Seattle area always get amused when snow is in the forecast. 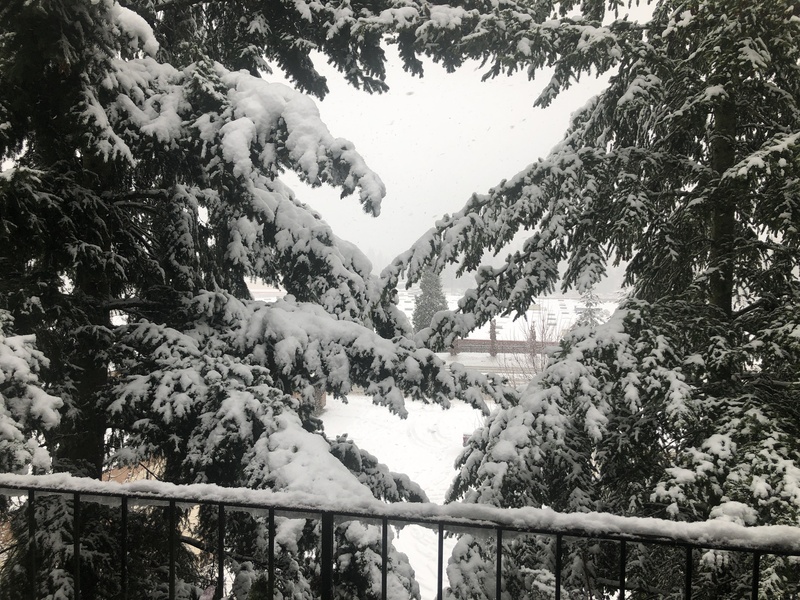 Native Seattlites and long-term residents leave work early, make grocery store runs, and prepare for the worst at any forecast of more than a dusting of snow. “It’s only 2/4/6 inches!” these recent arrivals shout. “You guys are really overreacting.” If those people still live here the following winter, they do not repeat that folly. I grew up in the central Rocky Mountain region, where temperatures of -25ºF were common, where snow was deep enough most Octobers that you had to wear snow boots and a heavy coat to go trick-or-treating as a child, and so forth. So I thought I knew all about snow and cold weather. As a teen-ager when we first moved to western Washington I didn’t get it either. There are several reasons it is different. First, we just don’t get that much snow here, at all. Maintaining large fleets of snowploughs that only get used about once every three years just doesn’t make sense for most city and county governments. We have plows, but most are the kind that can be attached to generic utility trucks. So they aren’t quick to deploy, and the drivers don’t get much practice most years. A related issue is that usually we just don’t get that cold. The ground (and especially the asphalt on roads) stays much warmer throughout the winter than at other places. That means that if we get more than a dusting, the first bunch of snowfall immediately melts when it hits the roadway, but then as more snow falls, the asphalt gets cold enough that that melted snow turns into a sheet of ice. Which more snow is falling onto. Anyone who has lived in places that get lots of snow and has driven on it should know that there is a big difference between driving on snow and driving on ice hiding under snow. Then there is geography. It’s very hilly here. Really hilly. And again because we don’t get freezing weather and snow often, people build houses on hills that in other parts of the country no sane person would. Several of the small towns I lived in back in Colorado, Utah, Wyoming, and Nebraska had one or two stretches of road on steep hills. Those roads never had houses or businesses along them, and every winter the city would put up big roadblocks to completely block that section of road until spring. It was a convenient short route during the summer, but the rest of the time it was closed because it is too steep to drive on safely with snow. About 80% of the roads in Seattle are as steep as the hills that used to get blocked off every winter in those small towns. Because of the microclimates and how easy a very slight shift in the upper atmosphere can flip us between snow, rain, sleet, or freezing rain, we occasionally get situations where the ground and sidewalks are covered in deep mixtures of snow, ice and slush. That is extremely hard to walk on, and your clothes get soaked with barely-not-freezing water. So even if you try to avoid driving, it can be an ordeal just to walk to a nearby store or to get to the nearest bus stop or light rail station. The sidewalks are particularly bad because while it is the responsibility of property owners to shovel the walks, most people don’t own snow shovels (cf. above mention that we only get significant snow about once every three years)—one of the local news blogs shared a video earlier this week someone posted online of a neighbor shoveling snow using a Swiffer (indoor mopping gadget). When you combine that with how many stretches of sidewalk go past large apartment buildings (whose owners are just as unlikely as individual home owners to own a snow shovel) and how many stretches of road go past green strips and other public property which doesn’t get shoveled (or in my end of the region, how many neighborhoods don’t have sidewalks at all), well, it’s just a mess. This year’s event has been a combination of several of our worst problems. The first big snowfall a bit over a week ago turned into sheets of ice with snow on top. Arterials were plowed and de-iced, but more snow kept coming, and sides streets all over the region remained icy slip-and-slides of doom. And more snow keeps coming. We get a break and people go out and try to shovel their drives and sidewalks…. and then it snows again. Then we got the rain/snow mix that put heavy ice on power lines and tree branches resulting in 90,000 households (including us) being without most of the night. For some perspective: in the last 10 days we’ve had 8 times more snow than Boston has all winter. We are already the snowiest February recorded in the area in 35 years. Seatac Airport has broken a record for most snow in a single day set in 1949. And we don’t know if it is over. Things are melting a bit today. It’s supposed to be much warmer tomorrow, which will cause more melting (at which point more trees will fall as the ground on all those hills I mentioned above turns to mud) and we may get a bit of flooding some places. Then another cold air mass looks to be moving in late Wednesday night, meaning all those wet street will turn to ice again just in time for the Thursday commute… and another wet air mass is coming toward us from the south hitting either late Thursday or early Friday. That might mean more snow. It might mean rain. It might mean freezing rain. It is likely going to mean all three just depending on where you are. Yes! I may have to share this out on FB… because people really just don’t understand. And wow… I had not heard the tidbit about us getting more snow than Boston had had all winter. I forgot to mention another difference: our snow is always wet snow, never powder.